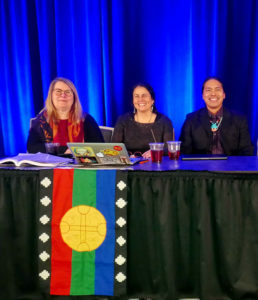 Dr. Pam Wilson, left, was a part of the 2018 American Anthropology Association annual meeting in November. Ten years ago, Duke University Press published Dr. Pam Wilson’s “Global Indigenous Media: Cultures, Poetics, and Politics.” This year, the anthology’s issues were discussed in modern context at the 2018 American Anthropology Association annual meeting. Co-edited with Dr. Michelle Stewart, the book’s 10-year anniversary brought it centerstage at a panel discussion during the conference Nov. 14-18 in San Jose, California. Wilson said she was honored because she feels her work makes connections between cultural anthropology and media studies. The professor of communication began the panel with guiding questions to navigate the new directions indigenous media studies have taken since the book’s publication. The other panelists then discussed their research and interests in the subject, including the media produced by the regions and communities they study. The segment concluded with an open discussion and audience questions. Wilson viewed the experience as the rare opportunity to receive feedback on her academic work. “When you publish an academic article or book, you rarely get much feedback, and so it usually just goes ‘out there’ into the world and you don’t often know how people feel about it.,” said Wilson. Outside the classroom, Wilson continues to research her many interests. Wilson’s current research includes work on two historical research projects, both involving southern history with indigenous media. She also has two novels she hopes to one day have published.